Hey girls! Finally we meet again with another super honest review from me 😁 Today, i'll share about my current go-to setting spray. From the packaging, the finish, i lovee it! And I have to spread it to the whole world, right? 😂 It is from Keep Cool, called Shine Fixence Mist, the pink one. This is not just an ordinary face mist, although i have to say that i often use it as setting spray 😂 Keep on reading, girls! The main functions and other important information is written on the box, but mostly written on Hangul (Korean's Language). I think it will be great if they have the translated (English) version on the packaging, or maybe write it on a paper inside the box. This face mist comes with a transparant box made from mica plastics. I love the design. The box's color have the same color with the products, and every variant have the different color. 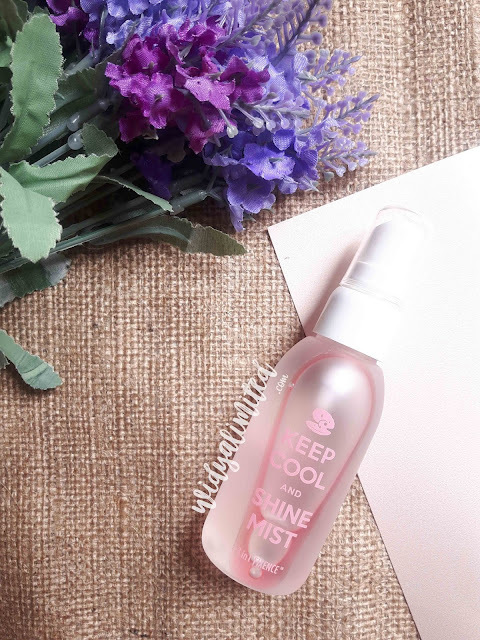 For this Shine Mist, the color is pink - white - transparant color, and feels so girly. For the Ocean Mist is blue - white and for the Soothe Mist is green - white. The products is packaged with a spray bottle with 60 ml netto of products. The bottle is made from a thick plastics, quite sturdy but still light in weight, so it's perfect to bring when you travel. The design is quite simple, only write the main information. The bottle itself is transparant with the doff laminated, so it doesn't feels slippery when used. The spray is great, the products quite well spread, and doesn't feel "sharp" when get into the skin. The products contain 2 types of liquid, so we have to shake the bottle before spray it to our face. The top layer is oil, and the bottom layer is water. The oil layer is very thin, maybe only 5% - 10% of total liquid. The oil layer is to "lock" the moisure on our skin. This Shine Fixence Mist has a great smell, which make us feel fresh. 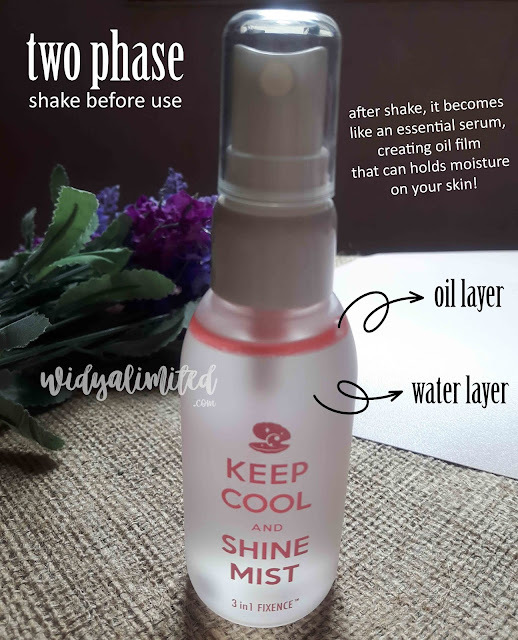 The finish of this product is dewy, like the product's name : Shine Mist 😄 This product is great for everyone who have a dried skin, or cakey makeup, or have to fix the makeup for long time used. The function will be described below. Before use, I always shake the bottle, so the oil layer and the water layer mixed. When I use this spray, i smell a really great smell, like a fresh rose or something, i don't really know but it's great. As i said before, the spray is great and don't hurt my skin. I use about 4 - 5 sprays all over my face. With the 60ml netto, i think it can be used for about 3 - 5 months if u use it everyday. 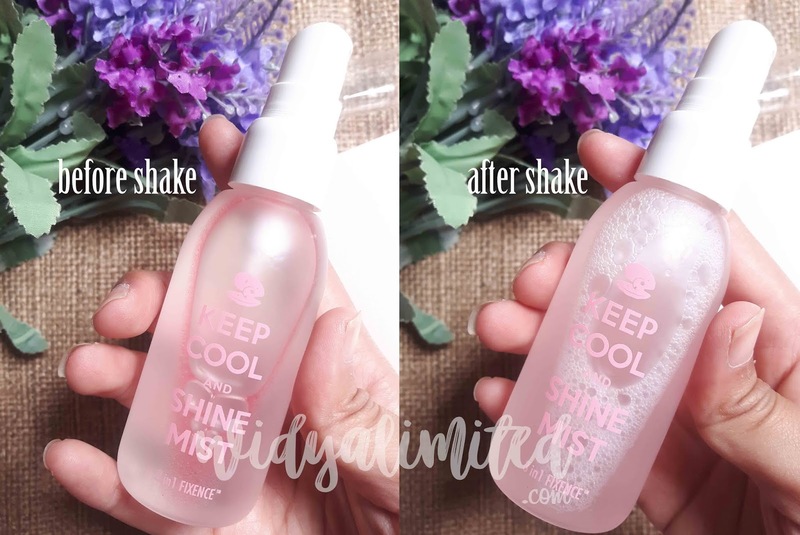 For me, even this Keep Cool and Shine Mist have 3 functions, i only use it as setting spray to fix my makeup, and sometimes as primer (before makeup). I love the dewy effect after use this spray. My makeup seems more natural, and last longer. My skin also seems brighter than before (only a little but it's ok for me who loves tan skin 😂 ). I prefer use this (click) to moisture my skin. *p.s* sorry for the unorganized post, i have to update this post later, maybe in 1 or two weeks i'll update this post. Really sorry, i just need to post this today. I hope you can understand. 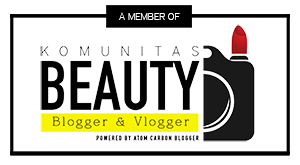 I love the name, super cool :) .. And it was chosen as one of the best products on its class by Allure? I show the stickers but it's in Koreans.. The packaging so cute ... i love it . Maybe i wanna try this face mist for my skin . And also for my makeup . Kemasannya cantik ya. 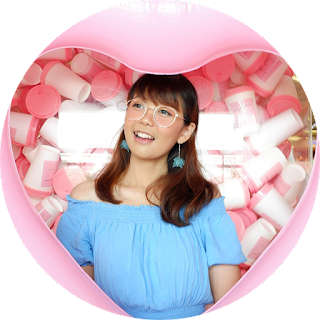 Ini tuh yang sering disemprot ke wajah ya kalau kulitnya lagi kering atau supayaa make upnya tahan lama. Pengen coba deh. Eh eh kok imut yaaaa..
Lumayan irit ya beb bisa bertahan sampe 5 bulan walau digunakan setiap hari. Aku pengen banget cobain produk ini huhuhu. Cocok untuk kulit sensitif ga kak? packagingnya cantik banget .dan klaimnya bikin penasaran. should i buy it beb?